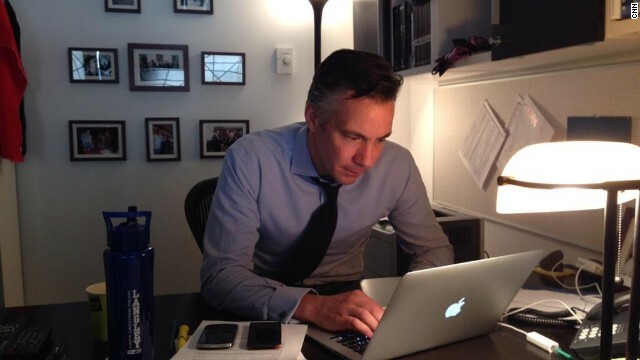 CNN's Chief National Security correspondent Jim Sciutto covers everything from U.S. foreign policy, including international hotspots such as Iran, Syria, Iraq and Afghanistan, to defense, terrorism and intelligence issues such as NSA mass surveillance. On Monday at Noon ET, he'll be taking your questions on Reddit on anything relating to national security and his experiences covering the beat for CNN. Now is your chance to ask him anything! Maleki Shia Iraqi president ? !signed up contract with his master Iran regime to buy weapons to kill Iraqi Sunni! Was this the goal of USA to pass the Iraq to the supreme leader of Iran? What do you think Thomas Wheeler is up to and how will our National Media feel the restraints of his govt.media rope ? Like an Old Western movie and the media is on the horse and the rope around the anchor's neck. 47 USC & 151 Communication Act of 1334. It's not what the news tells us ,it's what they don't. Explain the Chem trails and operation DEEP BLUE is the air traffic controllers turning them into media ! What is weather warfare and how advanced do you think that is ? Will the FCC allow you to write about that and tell the citizens ? 1.6 billion rounds of ammo purchased for Homeland Security and what are they doing with all that ammo ? Cuts will raise troops grocery bills ? An estimated 900,000 vets on food stamps .....? This is like a Big Mama Thornton.."Down Home Shake Down". Army 440,000- 450,000 and that's a 10% deeper cut and in 1940 they had 267,000 active members.General Martin Dempsey says 420,000 not enough.Special Operations 66,000 to 69,700 to deal with counter terrorism and crisis response. The o'l A -10 warthog eliminated and replaced with the F-35. What does that look like and they didn't show the citizens a picture. Tank Killer eliminated and that sounds like a good idea,is it ? Saves 3.5 billion dollars to eliminate the tank killer and it sounds old and rusty. See US Debt ! Take the power away for govt. to borrow. –K-o-c-h–kills t.v. station after killing meaningful HCR they turn around and brag about it through their secure proxys...political 403.4's hiring liers to shape America to their exact oligarcy plutocracy @ the exspense of lives hundreds of million usi.ng dollars billions to be exact. Our U.S. government does need the media to help indoctrinate the masses, and the media eagerly complies. I used to believe media compliance had selfishly to do with increasing readership and therefore profits, but now I believe media compliance and parroting of our government's desires and ambitions are much more sinister collusions than mere compliance. Do you, of course, disagree? elected to carry out the will of "we the people." who can repair our nation and our world? so do not care to give hope and help? is a sinking ship of fools? to all of our own citizens who need hope and our help? Why the USA is easy to the Iran regime and happy to negotiation for nothing!? – They control the Iraq and Syria dictator Shia governments and the Supreme leader military are killing the Sunni Syrian and Iraqi people? Iran regime is supporting 5000 Hezbollah members in Syria to kill innocent Syrian women and children. – The Iran regime never permitted to the UN inspectors to visit the Nuclear sites like Fardo and Parchin. They claim that those places are military sites and forbidden for any inspection?! – The dictator and corrupted regime of Iran have executed Thousands of oppositions and have a packed of prisons in the execution waiting list. – This regime disregard human rights and do not accept any UN human rights inspection. – It was not real president election last year. Supreme leader announced 6 persons that he trusted and ask Iranian vote to one of those! For example Hassan Rouhani was security adviser of supreme leader for over 17 years! Some Iranian voted to bad against the worst because there afraid of the worst! – The country is under control of supreme leader and his Islamic Revolutionary Guard Corps (IRGC) with gained unprecedented political and economic power and nothing changed even after assigning of Rouhani as president. 3- The dictatorship being continued and still no right for free speech or write or even access to the Facebook or watching satellite for public even no right to quit the country. Thousands of political and religious prisoners still are in the jail without holding any court and having right for getting lawyer. The Facebook and Internet access have been filtered for public usage. – The regime spend Billion of dollars for extreme groups in Iraq, Egypt, Afghanistan, Bahrain and Syria and Lebanon like Hezbollah to make tension and get the control of region and also have big plans for rocket and bomb to expand its empire. – The Iranian people hope for real changes and real elections not cosmetic changes by reformists. The former president Mohamad Khatami failed to even bring democracy and any hope for Iranian 9 years ago. – The Iranian people were very happy when Mr. Obama got elected, but there is big disappointment from Iranian when he ignored all the democracy requests from people. How many more of our finest sons and daughters and then their children will somehow be coerced and convinced by government, church, family and friends that “there are no diplomatic alternatives left,” so they must go to war as bravely as we did and our ancestors did. So now I ask you how many more of our finest sons and daughters and then their children will somehow be coerced and convinced or ordered to become brave soldiers in order to pass one of the entrance rites to adulthood? With the proposed 120,000 Army servicemen (570,000 to date to Purposed future est. 450,000) cut for the defense budget, who is going to pay for the unemployment benefits X Army personnel will be entilted to during transition back into civilian status. The unemployment rate is high enough in this country let alone adding more people to the unemployment line. Just seems like we are moving working class people into unemployment status to cut the budget which moves unemployment payments to more unemployed X service members. Dosen't sound like we are cutting the budget to me, we're just moved it to another overloaded part of the United States Unemployment Budget. Hi Jim, Do you think this announcement is a sign of a larger calming of international powers? Sure we have places like Ukraine, Egypt and Syria in turmoil. But do you feel or have any info. that would suggest the biggest powers such as the US, Russia, China and Iran have the broader picture under control? Seems like a strange time with the flux in Ukraine to announce cuts. Surely the administration feels pretty good about our safety. And has NSA surveillance played a role in our willingness to draw down manpower? Thank you sir! Why cut this nations security when the spending problems start at the top of the heap! I'm not one of these left wing idiots that think we can do with less protection for our country. Make the spending cuts where necessary, from Obama down. Oh yea, tell Hagel to fend for himself if something happens also! Clown logic. Defense is where every discussion should start and end buddy. And please dont refer to yourself as left wing, that would be an insult. Drones, passive radar guidance, switchblade UAVs just way too many new force multipliers to list. Sorry Id rather have the best trained, best equipped men and women instead of a human wave force like China. Of course this requires you to think your way out of "defense cuts = bad". Im pulling for you. If you can read I said I was NOT a left wing idiot. I would just like to see the wasted spending at the top stop and not make cuts at the defense program of our country. 9/11 conspiracy – that's an easy one. The Pentagon is reducing the number of military troops but has the number of defense contractors been reduced as well? They are firing tons on contractors here in the Navy. With large cuts to the number of soldiers should there be a sense of urgency to raise the number of Special Forces troops tp offset any skill gaps in the future. The past 8 years has seen these forces used more frequently than in years past, and with the pool of potential candidates reduced this will also reduce the number of qualified candidates for these critical positions. I guess my question would be: are the troop levels for special forces going to remain the same, and if so how do they plan on filling these postions with a reduced pool of candidates? Tier 1 has seen a huge increase in manpower over the past 5 years. Part of the technological advances they speak of are SF gear and tactics. However a key to a Tier 1 operations success is surveillance. I would think one of the most valuable advancements has been the NSA surveillance program. Like it or not and whether you were paying attention or not when they announced it 13 years ago, its been a valuable tool and only gets better as the technology catches up to the giant pools of data.